Yesterday, I finished his In the Footsteps of Crazy Horse. First thing I'll say? Get it. Order it now. It won't hit the bookstores till later this year, but pre-order it for your own kids and your library. Like The Journey of Crazy Horse, it provides insights and stories that you don't get from academic historians. To my knowledge, there is nothing like it for kids. Some of the reasons I'm keen on it? First, it is set in the present day on the Rosebud Sioux reservation. Regular readers of AICL know that I think it is vitally important that kids read books about Native people, set in the present day. Such books provide Native kids with characters that reflect our existence as people of the present day, and they help non-Native kids know that--contrary to what they may think--we weren't "all killed off" by each other, by White people, or by disease, either. Second, the protagonist, Jimmy McClean, is an eleven-year old Lakota boy with blue eyes and light brown hair. Blue eyes? Light brown hair?! Yes. His dad's dad was White. Those blue eyes and light brown hair mean he gets teased by Lakota kids and White ones, too. Third, it is a road trip book! I love road trips. Don't you? In this one, his grandfather (his mom's dad) takes him, more or less, in the footsteps of Crazy Horse. Along the way, he learns a lot about Crazy Horse, who--like Jimmy--had light brown hair. When his grandfather is in storytelling mode, giving him information about Crazy Horse, the text is in italics. Fourth, Jimmy's mom is a Head Start teacher! That is way cool. My little brother and my little sister went to Head Start! When I was in high school, I'd cut school and volunteer at the Head Start whenever I could. But you know what? I can't think of a single book I've read in which one of the characters is a head start teacher, but for goodness sake! Head Start is a big deal! It is reality for millions of people. We should have books with moms or dads who work at Head Start! I love that information! It tells readers that Native peoples were here first, and we had names for this and that place. Sixth, they visit a monument. His grandpa tells him that the Lakota people call it the Battle of the Hundred in the Hands, and that others call it the Fetterman Battle or the Fetterman Massacre. 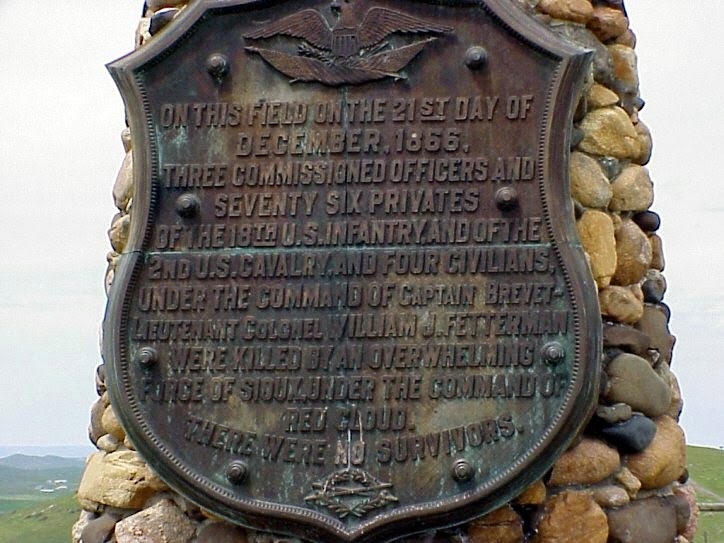 They read the inscription on the monument. See the last line? It reads "There were no survivors." That is not true, his grandpa tells him. Hundreds of Lakota and Northern Cheyenne survived that battle. It is a valuable lesson, for all of us, about perspective, words, who puts them on monuments, why those particular ones are chosen, etc. Last reason I'll share for now is that Marshall doesn't soft pedal wartime atrocities. Through his grandfather, Jimmy learns about mutilations done by soldiers, and by Lakota people, too. It isn't done in a gratuitous way. It is honest and straightforward, and, his grandfather says "it's a bad thing no matter who does it." 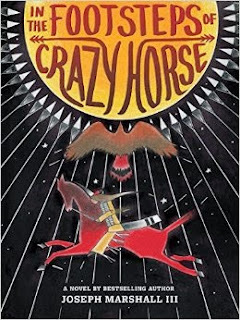 The history learned by reading In the Footsteps of Crazy Horse and the growth Jimmy experiences as he spends time on that road trip with his grandfather make it invaluable. In the Footsteps of Crazy Horse, with illustrations by Jim Yellowhawk, is coming out in November from Amulet Books (an imprint of Abrams). Pitched at elementary/middle grade readers, I highly recommend it. Again my brother and friend Joe Marshall has done it again. Congratulations to Joe for setting the standard for truth and compassion.